People routinely ask SemiAccurate about ARM CPUs which is an odd question because ARM makes absolutely no silicon. That said they do design cores, GPUs, interconnects, and lots and lots of related IP but they manufacture absolutely none of it. If you are one of the ~320 ARM partners you don’t buy anything physical, a partner just licenses designs, support, and tools. The company makes nothing physical you can buy, just IP to license and tools to use with that IP. Another ironic bit is that you can’t actually make a full SoC with what you get from ARM, you need to make or license other IP from other sources to have a complete device that you can eventually manufacture. With each passing day ARM fills in more and more pieces but there are lots of additional areas for a thriving ecosystem to sell both complementary and even competing designs to. ARM lists 320 partners with over 1000 licenses, all of which are currently active and producing royalties. Anything not being produced or still on track to be produced is removed so those numbers are all live accounts. If that sounds like a large number of firms making ARM based designs, their output is staggering, a total of about 2.5 billion chips a quarter or 10 billion chips a year. If ARM makes nothing but IP, what do partners license? As you might guess that is not a simple question. There are seven basic license types shown in the slide above, and they range from free to very expensive as you go up the pyramid. The bottom two aren’t really meant to make chips with, in fact ARM said the lowest tier designs would not even work if physically implemented. The Academic/Research license is just that, it is free to academic institutions and is meant to give students the ability to work with a real core that does real things like they would working in the industry. If you try and take the design and make something physical, you won’t get very far but for simulations and things you do in school it is a great tool, well worth the price. The next step up the line is called DesignStart and it is also meant for testing, learning, and possibly some non-profit work too. The main difference between it and the Academic version is that it will actually work if you scribe it on silicon so there are a few more controls put on it. You can see how this would be useful for more advanced research and higher level university work. If you want to try out an accelerator design it helps to have a working core to send it data. The main stipulation in this license is that it is not for commercialization. That said there are probably a number of college projects that have morphed in to startups. For these types of companies, ARM would likely be more than happy to upgrade your license for a nominal fee to a commercial license. While ARM did not say exactly what this level costs, you can assume it would cover costs that ARM has to bear and little if anything more. That is where the next tier comes in starting with the Multi/Single Use, both for a single core design. For Multi Use it just means you can use a single core for multiple designs, think an A9 for a single core SoC and a similar dual core SoC. It could also be for many disparate projects, it doesn’t matter to ARM what you do with them as long as your check clears. Term is best thought of as an extension to Multi Use but for as many things as you want to design over a set period of time. You can see where this type of license is useful especially for things like embedded and automotive where many year life spans are a requirement not a bonus feature. This would allow flexibility to meet market needs as technology changes, think shrinks and variants requested by end users years in. The next tier is very similar to Term but without the term. If you want to design a lot of things based on a single core any of which may need to have a really long lifetime, Perpetual is for you. It makes no sense to those not in the embedded world, but for embedded designers this kind of things is absolutely necessary. If you think about the lifespan for things like large aircraft, building heat/cooling controllers, and infrastructure, how long is the support lifetime for them again? Think an airline would be happy with Boeing if they said they can’t make any new anti-lock brake controllers for a 20-year old plane that the airline has to replace by law? How happy would Boeing be with their supplier if they were told that more couldn’t be made? User facing compute devices age worse than fish on a hot day but embedded lives forever, and Perpetual licenses are made for them. On top of the standard product pyramid is the Subscription license, one that SemiAccurate hadn’t heard of prior to this briefing. It is the most comprehensive access to all of ARM’s standard products, and we mean all. There aren’t many companies in this tier and as you would expect, they are big players that do a wide breadth of stuff. ARM says there 10 companies with this license, Samsung, ST, Broadcom, Renesas, and LSI were named with terms range up to seven years max. Subscriptions may seem like a rather silly thing for a company to do, ARM makes dozens of cores and lots of other IP, even the biggest of the big boys don’t need all of it. There are several reasons that a company may want to get everything, flexibility being a key one. If you are going to make a new line of SoCs for a market you are not in yet, you aren’t sure what your customers may need, your customers aren’t sure what they will want, or simply knowing you are going to make a lot of products, it is easier to have everything on the table as options. It may increase the total initial outlay but it undoubtedly saves money per license if more than a small number are put in to use. ARM loves the subscriptions too because it takes the sales impetus off of them and ironically puts it on the licensee. ARM described this as the CEO saying, “I just spend all that money, you engineers had damn well better make it worthwhile.” In the end, Subscriptions lead to a company using more products and having more to sell. They get more products at a lower cost, ARM gets more royalty fees in the end, and best of all both save massive amounts of paperwork. If you can justify the cost, this one seems like a win/win for all sides. On top of the pyramid is both the highest cost and lowest licensee count option, but those two factors are probably not directly related. The reason is this one is called an architectural license and you don’t actually get a core, you get a set of specs for a core and a compatibility test suite. All of the licenses below it get you a complete core or other product that you can plug-in to your design with varying degrees of effort but you can not change the design itself. If you license a Coretex-A15 you get the same Coretex-A15 that the other licensees get, exactly. It may be built with very different surroundings and built on a different process, but the logic is the same. 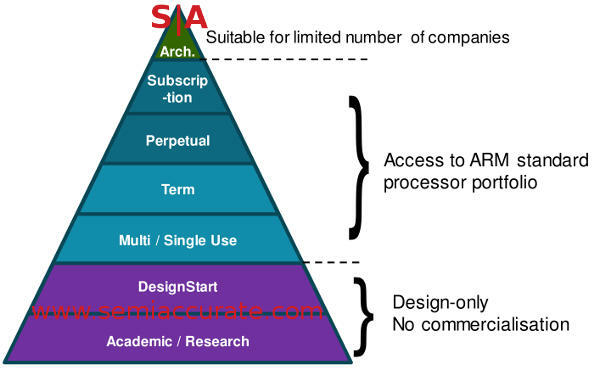 Architectural licensees get a set of specs and a testing suite that they have to pass, the rest is up to them. If they want to make a processor that is faster, slower, more efficient, smaller, or anything else than the one ARM supplies, this is what they have to do. Qualcomm’s Snapdragon line and Apple’s A6 are probably the most widely known current products resulting from an architectural license but far from the only ones. ARM says there are currently 15 architectural licensees which means most are not public yet. The down side is that you have to make a CPU from scratch and that is not easy, quick, or cheap work. ARM does a really great job at what they provide but it is by definition a middle of the road design because it has to please many customers in disparate markets. If you have a specific target market or set of priorities for your core, you can get a much better result by doing it yourself. That said there are few companies out there with the money, knowledge, vision, and sheer internal will to do a ground up core when a perfectly adequate one is available for far less outlay. How much does all this cost? ARM describes licenses as being in the $1-10 million range, likely per product. While they wouldn’t be specific SemiAccurate has heard that numbers at the higher end of this range and a few above it for some of the more modern cores. These license fees however are both negotiable to an extent and only part of the revenue stream for ARM. Think if them as weeding out the non-serious, covering the costs associated with supporting the partner’s development process, and obviously covering development costs of the core. ARM says they try to cover the core development costs with the first 10 licenses. All licensees are not equal however, the first few are called lead licensees and companies pay an added fee for this honor. This added fee is not paying for a time to market advantage, it is more just covering the added costs that ARM likely has to shoulder, mostly engineering time. ARM picks 2-3 lead licensees for each market segment and works closely with them. This narrows down the pool of initial partners to a manageable number and also ensures that anyone who is picked is up to the task of successfully getting a new core to market correctly. The partners get about a year lead time to market, critical for some, far less important for others. One footnote to add is that subscription licensees are explicitly not eligible for this program but can probably buy in. A program like lead licensees may seem like a disadvantage to those not in the program but if you think about the complexity of implementing a new core for a volume market it starts to make sense. Every core has bugs, headaches, and implementation foibles. Some are worse than others but you rarely see an A0 stepping on the market from even the top-tier players. Those in the lead licensee program do get better time to market but they also get headaches and cost. If you can wait to put out a device with a bleeding edge core you get the benefit of the lead licensee learning without the associated bruises. Note: This is Part 1, Part 2 will be published tomorrow morning.